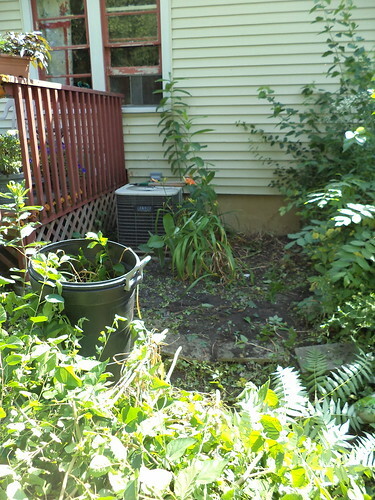 It was time to do battle with the weeds around the air conditioner. This is a long-term war. It's going to take many battles to win. I needed a reasonably decent day to start the war, one not overly hot and humid. Step 1: I need to clear around the unit again. 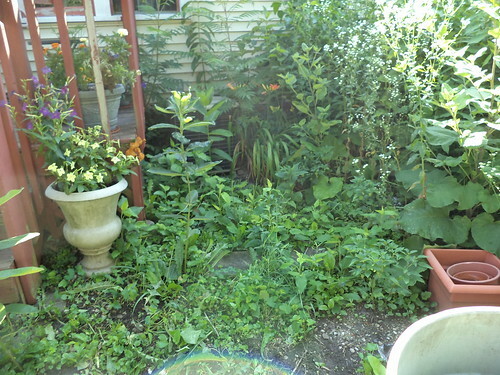 I had cleared this out at the end of May, but, as weeds do, more filled in. With the heavy rains last week, the ground was soft and pulling was much easier. Plus, with all the foliage, the ground was shaded and retained moisture, helping the uprooting process. After 40 minutes, the area around the unit looked like this. I had to cut back several small trees and sprayed them with Round-Up in the hopes that kills them. I found four milkweed plants. There has been one monarch in the back yard so I was loathe to pull any milkweeds. But my assessment of the area deemed two of them in the way so I removed them. I'm not sure about the tiger lilies on the south side of the unit. They are blooming so I didn't pull them, but I pulled most of the other ones I found. The clippings pile was fairly big. At this point, I took a break. I have to watch myself and not overstretch my stamina. I figured I'd leave this pile and deal with it the next day if necessary. But after a 20 minute rest, I (Step 2) cleared the pile into yard waste containers ready to be put out on Wednesday evening. That feels like a success. 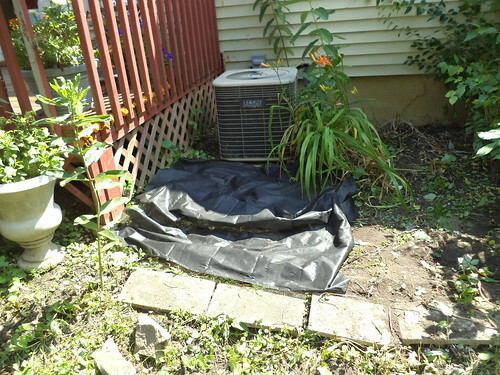 Step 3: Time to lay the landscape fabric. The most important place is in front of the unit. That needs to be clear for air circulation. It took two rows of fabric to cover the area. I've not worked with this before. It's very lightweight and easily blows in any kind of breeze. It also stuck to the bottom of my shoes so smoothing it was a problem. I finally gave up and left the bulges. I bought two colors, black and red. 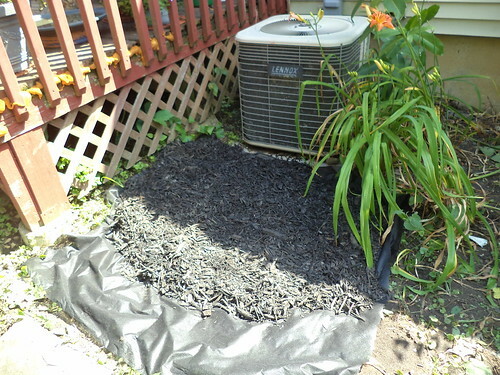 This mulch also comes in a light and dark brown. The black went down first. It didn't cover as much as I hoped it would. I laid another section of fabric and broke up the red bag. 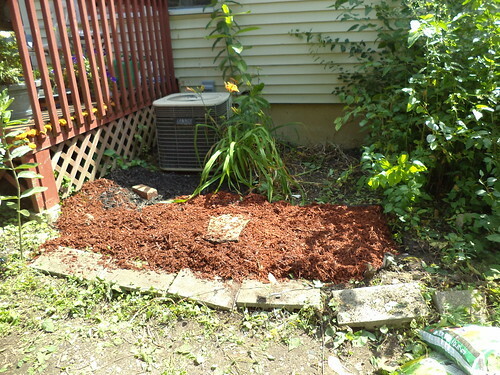 In the clearing of the weeds, I liberated a brick and a couple of rocks. I'm calling them my "strategic" rocks. I probably won't move them. They helped hold down the fabric while I spread the mulch. I think the red bag went farther than the black bag. I'm fairly certain I spread them to an equal depth. Maybe I didn't. This was all I could do on Saturday. I only had two bags of mulch and I filled all my yard waste containers. 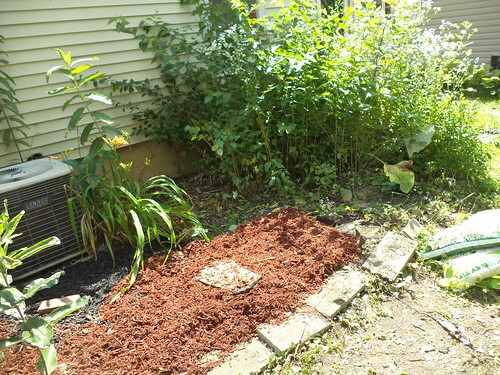 I don't have funds to buy more mulch right now, but this coming weekend, I possibly could pull and cut back the rest of this patch. Then I could spray the small trees in the patch in preparation for covering them with fabric. I know there are more stones and bricks in here. If there are enough, I could put down the fabric, weighing down the corners with stones. At least that would be done. I'm still going to go with the black and red color scheme. I like the blocks of color. This took two hours to do. I went inside, took a shower and then took a 2 hour nap. 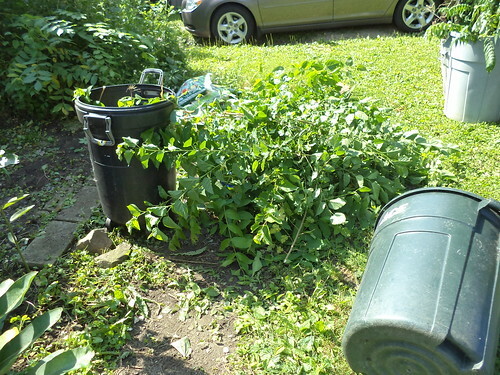 So, I'm not sure what to do with the garbage, recycling and yard waste containers which I've usually lined up here along the edge. To the right of this photo is a very overgrown area adjacent to the shed with the lawnmower. I've given consideration to having the tree service come out, after we get our bonuses, and assuming the bonus is sufficient, and remove all these overgrown trees from this area, grind out the stumps and rake it smooth. Then, I could put the cans over there in the spring, summer and fall, moving them in November near the house where it will be easier to have access to them. I'm thinking, next year, I can put pots of flowers here, or get another raise bed and put the peppers, which aren't doing as well as I'd hoped, over here. Decisions. Decisions. At least this project is started and will be finished this year.